The transfer window looms ever closer, and so, the prospect of young talents switching clubs is rife in the rumors. United is home to several such starlets, but none more prominent that Marcus Rashford and Anthony Martial. The duo started the season at the heart of a very successful selection dilemma that saw them dominate the wings week in and week out. But after the winter window, and particularly after the arrival of Alexis Sanchez, that dynamic has somewhat been broken. This has led to reports that they will be seeking new clubs in the future. In the case of Martial, big names seeking his signature seem to indicate an all-out transfer, whereas Rashford may depart in reported loan moves. Now, Jose Mourinho has had his say about the future of one of these talents. 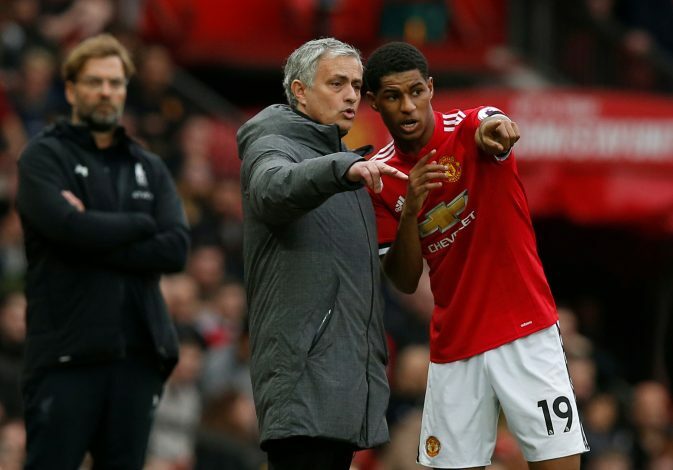 Speaking in a press conference ahead of the clash against West Ham, Mourinho responded to the claim of Rashford leaving by saying: “No. He impresses me. Mourinho also opened up about United losing to smaller teams this season, in contrast to their performances against the top 6: “For me to win against all the small teams and to lose against all the big teams – when I say ‘small’ and ‘big’, forgive my basic English, I would prefer to explain it another way.